Our 'Brilliant 2019' greetings card is the perfect way to bring in the wonderful New Year. What fabulous things do you have planned for the year ahead? This card is the perfect way to announce some exciting news or wish someone well for the year ahead. Maybe a friend is getting married, moving house or starting a new job? 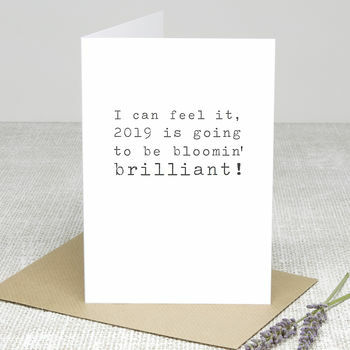 This card reads "I can feel it, 2019 is going to be bloomin' brilliant!" We use matt bright white 300gsm card and supply the card with a recycled brown envelope. The card and envelope are packaged in a clear poly bag to keep them safe and clean.